Avalon Organics Bath and Body - Organic Lavender Bath & Shower Gel -. Organic Lavender Bath &amp; Shower Gel from Avalon Organics&reg; could provide you with a gentle cleansing action that could leave you feeling fresh all day long. This bath and shower gel from Avalon Organics&reg; could help rebalance and restore moisture to your skin and provide essential purification. It contains wheat protein&sbquo; lavender oil&sbquo; and aloe for added benefits. These ingredients could cleanse the skin and provide moisture. Aloe vera is known to soothe the skin and help improve the condition of damaged skin. Calendula oil obtained from the calendula flowers is a common ingredient in various cosmetic products and could provide fragrance to the bath gel. Chamomile&sbquo; which is commonly used in herbal teas&sbquo; is also known to have a soothing and calming effect. When used in shower gels and soaps&sbquo; it could provide a mild aroma and a cleansing effect. Citrus oil is obtained from the rind and fruit of various citrus varieties like lemons&sbquo; limes&sbquo; and grape fruits and are rich in antioxidants and vitamin C. Vitamin C is said to be extremely beneficial for the skin&sbquo; because it can potentially prevent the activity of free radicals and reverse the effects of sun damage. Citrus oils may also add a fantastic fragrance to the shower gel. 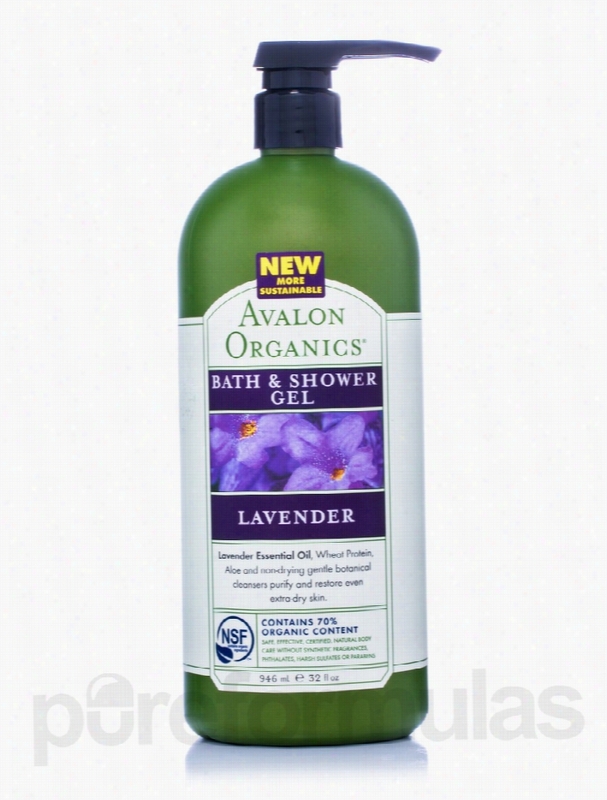 Organic Lavender Bath &amp; Shower Gel from Avalon Organics&reg; may provide the soothing aroma of lavender flowers to nourish dry skin. These statements have not been evaluated by the Food and Drug Administration (FDA). These products are not meant to diagnoseÃ¢ÂÂ treat or cure any disease or medical condition. Please consult your doctor before starting any exercise or nutritional supplement program or before using these or any product during pregnancy or if you have a serious medical condition. Nature's Gate Bath and Body - Lemongrass & Clary Sage (Aluminum Free). Neutralize the ill-effects of odor-causing bacteria and soothe sensitive underarm skin with Lemongrass &amp; Clary Sage (Aluminum Free) Deodorant Stick from Nature&rsquo;s Gate&reg;. Containing time-tested botanicals&sbquo; this deodorant stick helps absorb odors the natural way&sbquo; without causing skin irritation. Saccharomyces Ferment (vegetable enzymes) may absorb the odor causing ammonia and its chemical processes. Clary flower extract and clary oil have antibacterial properties and add fragrance to the deodorant too. Clary oil regulates the production of natural oils in skin to prevent drying effects. Aloe barbadensis leaf extract may work as an emollient to protect and moisturize sensitive underarm skin. Lemongrass extract in this deodorant stick from Nature&rsquo;s Gate&reg; may have antimicrobial properties and function as a natural astringent. Controlling odors and sweat production under the arms&sbquo; it helps you feel and smell fresh all day. Rosemary leaf extract combats itchy skin conditions in the underarms and has an inviting fragrance too. 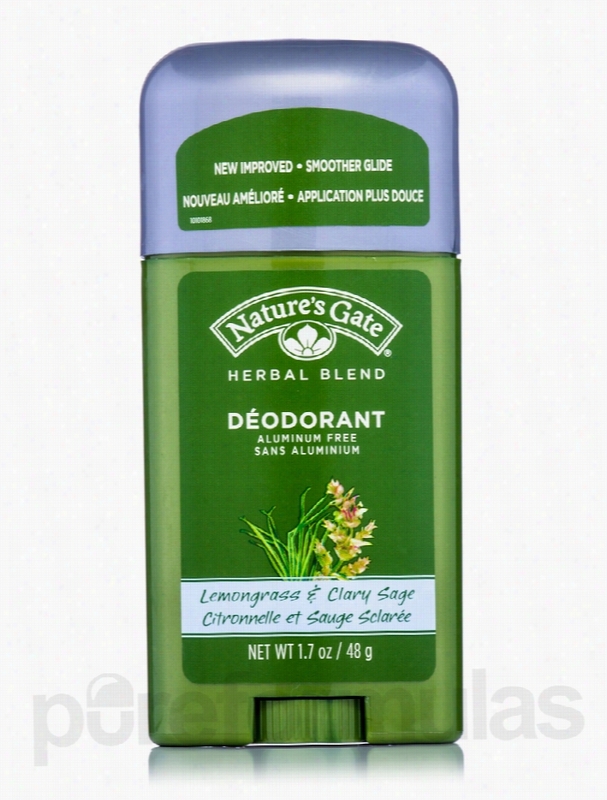 Lemongrass &amp; Clary Sage (Aluminum Free) Deodorant Stick from Nature&rsquo;s Gate&reg; is also enriched with extracts of marshmallow root&sbquo; horsetail leaf&sbquo; hops flower and bilberry leaf to keep you odor-free through your outdoors. These statements have not been evaluated by the Food and Drug Administration (FDA). These Products are not meant to diagnoseÃ¢ÂÂ treat or cure any disease or medical condition. Please consult your doctor before starting any exercise or nutritional supplement program or before using these or any product during pregnancy or if you have a serious medical condition. 2 oz Round Candle Tin.A great travel candle.Clean burning all natural soy wax candle with aromatherapy scent and color.Includes 1 to 4 color process laminated decal or one color direct imprint.Choose color and fragrance.Lead free wick.Eco friendly and biodegradable wax.1 3/8 " H x 2 "Dia. Silver tin. 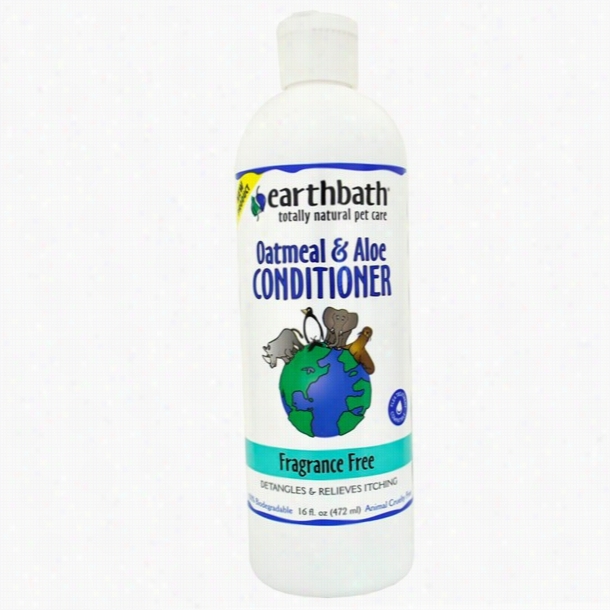 Earthbath Oatmeal & Aloe Fragrance Free Conditioner (16 oz). 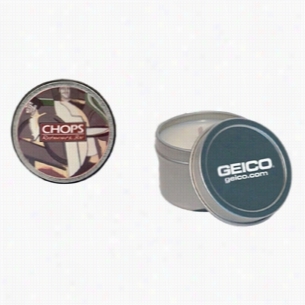 4 oz Round Candle Tin.A great travel candle.Clean burning all natural soy wax candle with aromatherapy scent and color.Includes 1 to 4 color process laminated decal or one color direct imprint.Choose color and fragrance.Lead free wick.Eco friendly and biodegradable wax.1 7/8 " H x 2 3/4 "Dia. Silver tin. 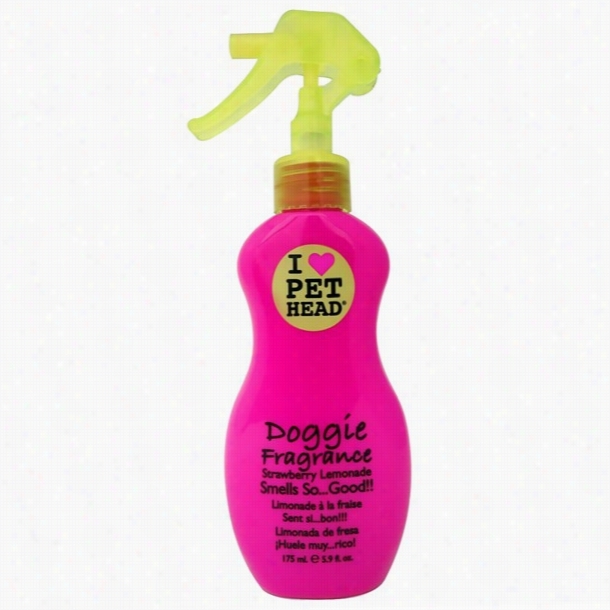 Doggie Fragrance Strawberry Lemonade Spray (5 oz). 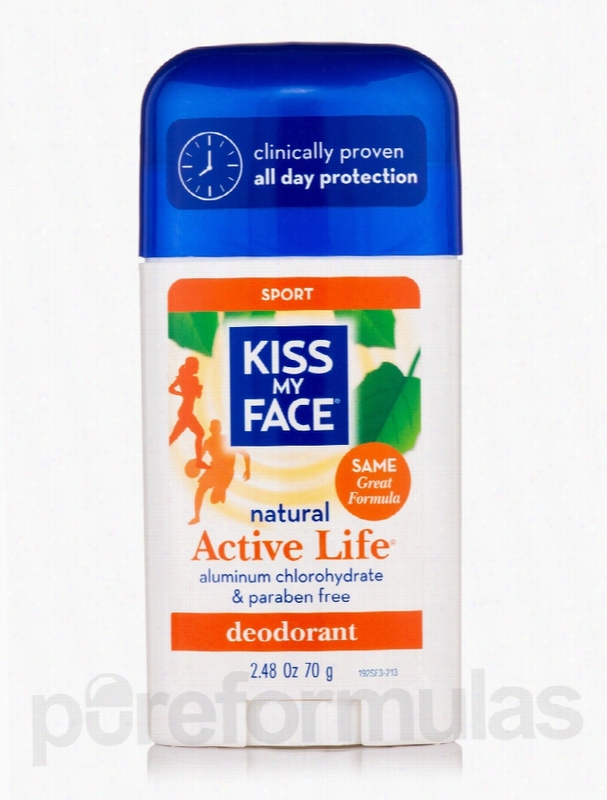 Kiss My Face Bath and Body - Active Life Sport Deodorant Stick - 2.48. Embrace freshness and renewed vigor all day long with the paraben-free formula Active Life Sport Deodorant Stick from Kiss My Face&reg;. Made from botanicals&sbquo; and other ingredients that absorb odor&sbquo; this deodorant stick has a sporty fragrance. Aloe vera leaf extract may hydrate and soothe the skin. With astringent and antimicrobial properties&sbquo; witch hazel extract could tighten pores and control sweating. With fresh&sbquo; citrus-like fragrance&sbquo; rosemary leaf and grapefruit seed extracts exhibits a refreshing aroma to the deodorant. Grapefruit works as a preservative to keep the deodorant fresh and usable for a long time. Containing glycerin&sbquo; this deodorant stick from Kiss My Face&reg; may suit sensitive skin. Glycerin hydrates skin&sbquo; locks in moisture and prevents your skin from drying out. Working as a natural deodorizer&sbquo; sage leaf extract prevents bacterial action and reduces body odor. Green tea has a citrus-like fragrance and its polyphenols may have a deodorizing effect to suppress odors. Enriched with the goodness of hops leaf&sbquo; coriander seed and thyme leaf&sbquo; Active Life Sport Deodorant Stick from Kiss My Face&reg; keeps you going through your outdoor engagements with confidence like never-before! These statements have not been evaluated by the Food and Drug Administration (FDA). These products are not meant to diagnoseÃ¢ÂÂ treat or cure any disease or medical condition. Please consult your doctor before starting any exercise or nutritional supplement program or before using these or any product during pregnancy or if you have a serious medical condition. 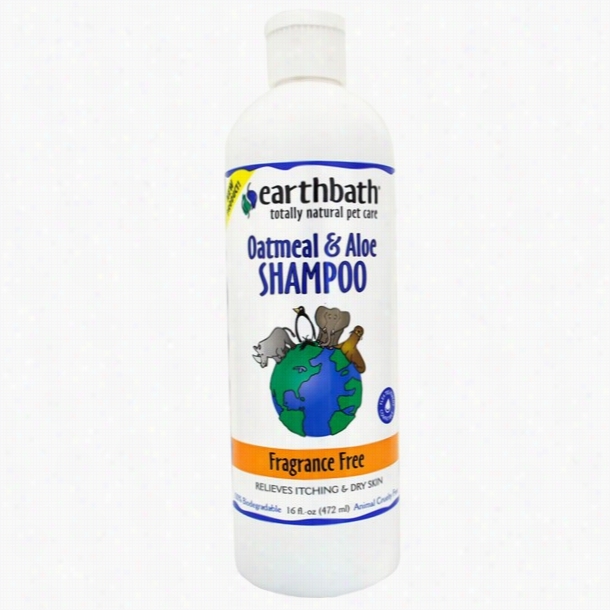 Earthbath Oatmeal & Aloe Fragrance Free Shampoo (16 oz). Juara Tiare Jasmine Awake Candle 8 oz. NEST Fragrances White Narcisse Gift Set 1 ct.